Following his previous colaborations, our friend Francisco Tavares from Pure Strength Training, and Strength and Conditioning from Chiefs Super Rugby bring us an article on Power training for football. Because maximum power is a key determinant for sucess in a diversity of football related actions, one of the major goals of a strength program target the development of power. In the majority of sport movements, like sprinting, jumping or throwing a ball, the time available to produce force is limited. For example, when kicking a football, the foot contacts the ball for a short period of time as ~50ms (Watkins, 2007). The short time available for one to produce force justifies the importance of power training. In this previous article, the importance of maximum strength for muscular power was discussed. As we had seen, power is influenced by both force and velocity, therefore it can be enhanced by increasing maximum force, maximum velocity or both (Newton & Kraemer, 1994). Given that most of the sport tasks occurs on concentric actions, a better understanding of this relationship can be observed on the force – velocity curve (figure 1). Figure 1 – Force-velocity and power curves divided on three different intervals of loads. Images of exercises are presented for each zone. For example, if one is lifting a high load (e.g. squat) the velocity of displacement will be low (figure 1. bottom right), whereas if the movement is performed with the bodyweight only the velocity of displacement will be high (figure 1. bottom left). Given that power is the product of force for velocity, one can get the power curve from the force velocity curve (figure 1. dashed curve). Vulgarly, strength and conditioning coaches divide the power curve on intervals, according to the range of loads, expecting exclusive adaptations on each of these intervals (Tavares, Valamatos & Mil-Homens, 2015). On the left extremity of the curve presented on figure 1, power is influenced mostly by high values of velocity that results from the lower resistances (i.e. % 1-RM). On the opposite side, the force side, velocity of displacement is low; therefore in this area of the curve, power is influenced by the maximum strength. Between these two extremes, one can find other training zones for power according to the range of lifted load. Because specific adaptations are expected from training on each load (and velocity) zone, it’s expected that a training program go thru all zones of power (figure 2). This way, each phase (i.e. 3-5 weeks) of a training program can target one or more load zones. In fact, superior adaptation on power results from training on multiple zones of the curve rather then training on either high load zone or low load zone (Cormie, McCaulley, & McBride, 2007; Harris, Stone, O’Bryant, Proulx, & Johnson, 2000). A strategy that is commonly implemented by the S&C coaches is to go thru a different range of loads during a single training session (Tavares, Valamotos & Mil-Homens, 2015). Normally coaches go from the lower load exercise to the higher load exercise (Haff & Nimphius, 2012). Thinking on a lower body session, athletes could start with vertical bodyweight jumps (0% 1-RM), then hexagonal barbell jump squat (~30% 1-RM), finishing on a traditional back squat (>85% 1-RM). This way, besides training different zones of the curve, S&C guarantee that a maximal stimulus is maintained so the maximum strength is also maintained. Other strategy that is vulgarly used by S&C coaches is to choose the load that maximizes power output. Although there can be found different values on literature for each exercise, one must be aware that the load that maximize power is individual and is not necessarily the same during a training season. For this reason, power output should be assessed often. 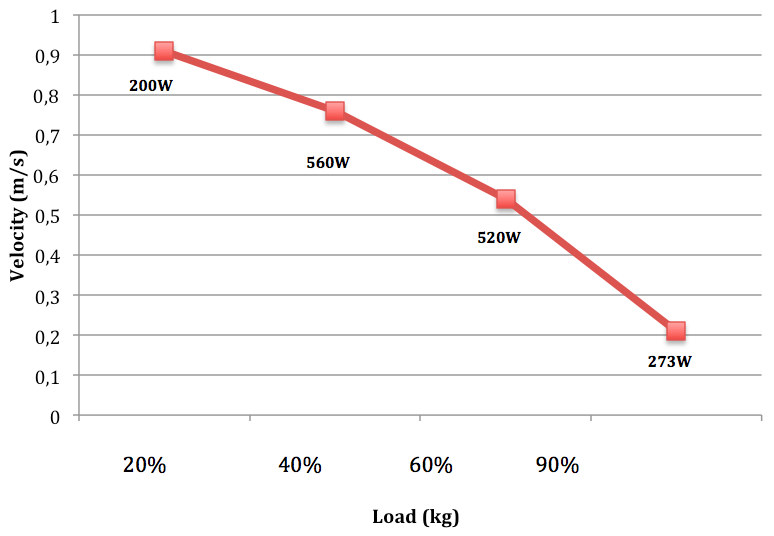 As discussed on this previous article, power can be assessed with or without extra load. 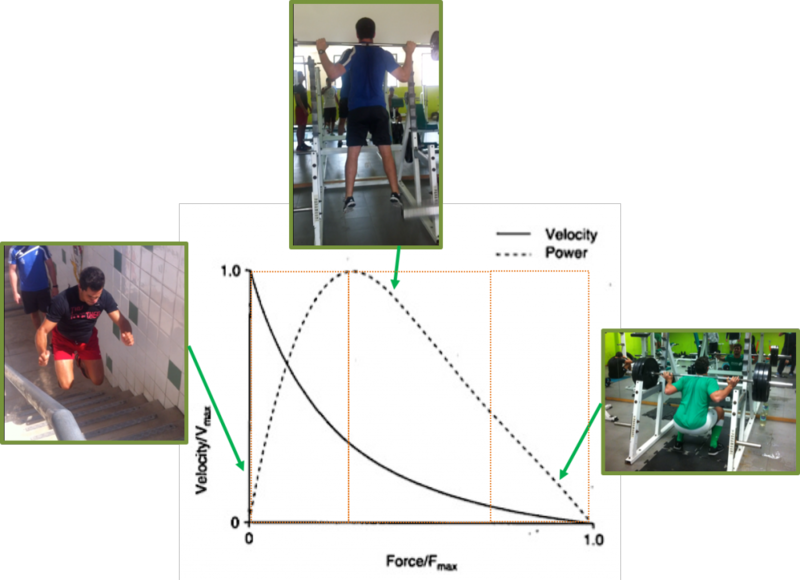 In order to obtain an individual force-velocity (or power) curve, power must be assessed on various loads for each exercise (figure 3). Figure 3 – A force-velocity curve of a subject with a maximum repetition of bench press of 120kg. The peak power is presented below the square point. Force platforms, linear position transducers (LPT) and contact mats are the most commonly used equipment for power estimation (figure 4). Figure 4 – Different equipment for measuring power. From left to right: Force-platform, linear position transducer and contact mat. The first ones allow for direct measurement of force and therefore the estimation of power. Although very precise, they are very expensive. Nevertheless there are already some portable versions that are used by some sport teams. Linear position transducers consist on a cable that is hold to a barbell and allow measuring the displacement and velocity. If load is introduced power can then be estimated. This type of equipment is much cheaper then force platforms. By the fact that LPT are much cheaper and friendly user in comparison to the force platforms, this makes it probably the most used equipment for measure power on the gymnasiums of sport teams. Contact mats are the cheapest form of one to measure power. Basically this equipment makes a stopwatch start when there is no contact on the mat, stopping it when contact is restored. Using formulas allows for the estimation of height (in the case of jumps) and power output. Because when training for power, each repetition should be performed at a maximal effort, vulgarly S&C uses a visual or auditory biofeedback to inform athletes of their performance on every repetition. This is other of the important aspects of using equipment that quantify power during training. Because maximum power output relies mostly on the phosphates energy system, methodologies that target adaptations on maximum power must guarantee that each repetition is performed under a full recovery state. Therefore, power training should be at least 48 to 72h after other training stimulus and a minimum of 1 minute should be given by each 5 seconds effort (Cramer, 2008). Moreover, if one is measuring power, he or she can ends the set when a decrease of ~10% is observed. Because most of sport actions occurs on a ballistic fashion and given that when performing a traditional exercise there is always a deceleration phase, when training for power one should choose to use ballistic type of exercises. This is even more important when training with lower loads. For example, when performing a maximum repetition for bench press, the deceleration phase corresponds to 23%, being that when the load is decreased for 80% 1-RM, the deceleration phase increases for 52% (Elliot, Wilson, & Kerr, 1989). Every athlete should be aware that the velocity of contraction differs from velocity of displacement. Therefore, even when training with higher loads, directions should be given to try to move the resistance as fast as possible. This makes a huge difference on neuromuscular responses and power adaptation to training stimulus. Because most of soccer actions occur on a low force, high velocity zone of the curve, power training should be specific of that load zones. By the fact that strength affects positively power output thru all loads, it is of extremely importance for an athlete to continuously be stimulated to maintain his or her values of maximum strength high. In the case of soccer, one single strength training unit per week appears to be sufficient to maintain the values of maximum strength and speed at a professional level (Rønnestad et al., 2011). Soccer is a competitive sport that can have until two matches per week, the scheme of work must be adapted in order to ensure that there is no cumulative fatigue from previous training sessions. During the off-season period, when the volume of technical-tactical training is low, and there are no competitions, the greatest volume of training is generally dedicated to strength and conditioning (Wathen, Baechle, & Earle, 2008). This way, during off-season period it is possible for soccer teams to have 3 to 4 gym sessions a week, targeting essentially increases on muscle mass and maximum strength. When competitions begin, strength-training units are normally reduced to 1 or 2 sessions a week. Nevertheless, athletes who really need to enhance any strength related issue can increase their number of gym sessions per week as long as the technical-tactical work decreases. Gym sessions can also be eliminated from a particular week of training if a team is playing for 2 matches on that week and the medical staff determines that a reduction on training load is needed. An example for the weekly organization of strength training is presented for a situation with one match at Saturday and a situation with a match at Wednesday and Saturday (table 1). There we have two options of possible team periodizations within the week, that should be seen as an example rather than a must. In order for a clear understanding for the reader, the technical tactical load are represented in the top (i.e. coloured table) and the resistance training in the bottom of each scenario. Table 1 – Example of the organization of a training week accordingly to the number of matches with 2 possible scenarios, A and B. 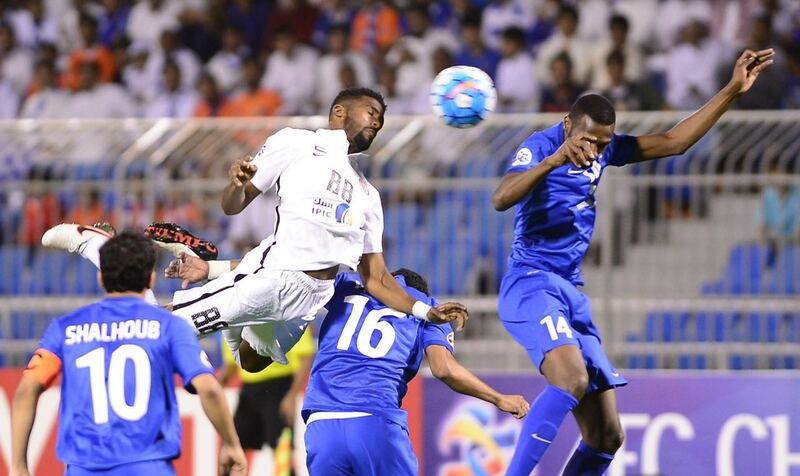 On the 1 and 2 matches week schedule, the previous game was on Saturday. *S, strength training (1-6RM) P, power/velocity based training (0-30% 1-RM); A, auxiliary training (6-12RM); ?, a training session that may or may not be included. The colors represent the technical-tactical or game training load. Red is high intensity, orange moderate, green light, and blue recovery or off. Because the most common week during the in-season period consists on teams playing one match per week, this scenario (B; 1 match) will be used as an example. If a team is playing each Saturday there is probably an opportunity for two strength-training sessions a week. One of them should target maximum strength maintenance, and the other power (with low load high velocity). For the power session, athletes can perform ballistic type of exercises with bodyweight only and/or with individual load that maximize power output (e.g. ~30% 1-RM). The detection of the load that maximizes power output requires individual assessment of force-velocity curve (see power assessment). If an athlete did not achieve the desired maximum strength values he or she might have some auxiliary work (i.e. morphological methods) performed on the first training session or have some low-volume maximum strength training on the second gym session, whereas if more increases in power are desired, one can choose to reduce the strength training volume on the first day and also include power on this day. As discussed previously, all exercises should be performed without fatigue so enough rest should be given between sets, exercises, and when needed, repetitions. Nevertheless, and understanding that in soccer very often the time is scarce, each training session takes approximately 25 minutes and 15 minutes for power session and strength maintenance, respectively (table 2). 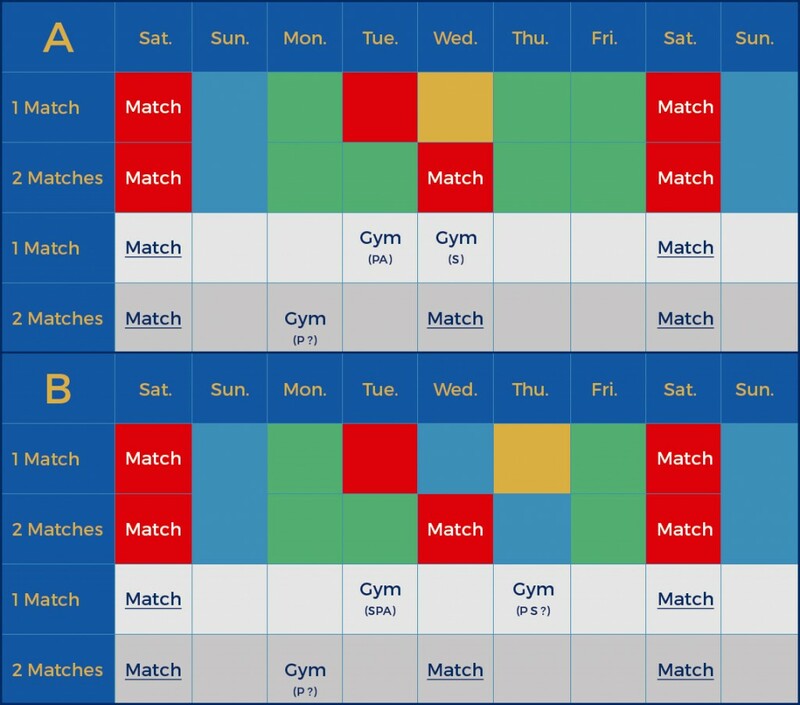 If no matches are scheduled for a week, it can be an opportunity for a three-gym sessions scheme. Nevertheless, this week can also be used as a unload week. This decision will depend on the competition calendar and the fatigue level and readiness of each player. Given the case that the coaching staff decided to implement three gym sessions on that week, the options are to use 2 sessions targeting increases on maximum strength and 1 session targeting increases on power, or the opposite. This will depend on each athlete major limitations. If a team is playing 2 matches on a week, there will be only one or none gym sessions on that week. After determining the fatigue level, coaching staff can choose to have a mixed session where both power and maximum strength are the goals. And example of a mixed session was given previously on this article. Strength and conditioning coaches should be aware that training intensity and volume, beside other training variables, should be manipulated on a periodized manner in order to maintain an adaptive stimulus for the neuromuscular system. An overview of periodization and a deeper look at training plan will be covered on following article. Cramer, J. (2008). Bioenergetics of Exercise and Training. In T. R. Baechle & R. W. Earle (Eds. ), Essentials of Strength Training and Conditioning (pp. 21–40). Human Kinetics. Elliot, B., Wilson, G., & Kerr, G. (1989). A biomechanical analysis of the sticking region in the bench press. Medicine & Science in Sports & Exercise, 21(4). Newton, R. U., & Kraemer, W. J. (1994). Developing explosive muscular power: implications for a mixed methods training strategy. Strength & Conditioning Journal, 16(5), 20–31. Rønnestad, B., Nymark, S., & Raastad, T. (2011). Effects of in-season strength maintenance training frequency in professional soccer players. 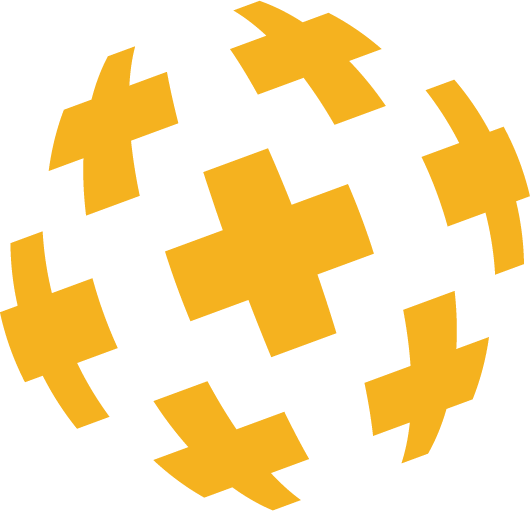 The Journal of Strength and Conditioning Research, (25), 2653–2660. Tavares, F., Valamatos, M. J., & Mil-Homens, P. (2015). Methods of strength training (In Portuguese). In P. Mil-Homens, P. Pezarat, & G. Mendonça (Eds. ), Strength training – Volume 1: Biological principles and methods of strength training. Faculty of Human Kinetics editions, University of Lisbon. Wathen, D., Baechle, T., & Earle, R. (2008). Periodization. In Essentials of Strength Training and Conditioning (pp. 505–522).